Recetas graciosas y saludables by Graciela Castellanos has simple recipes in Spanish. Best of all, these recipes are extension activities for short poems. 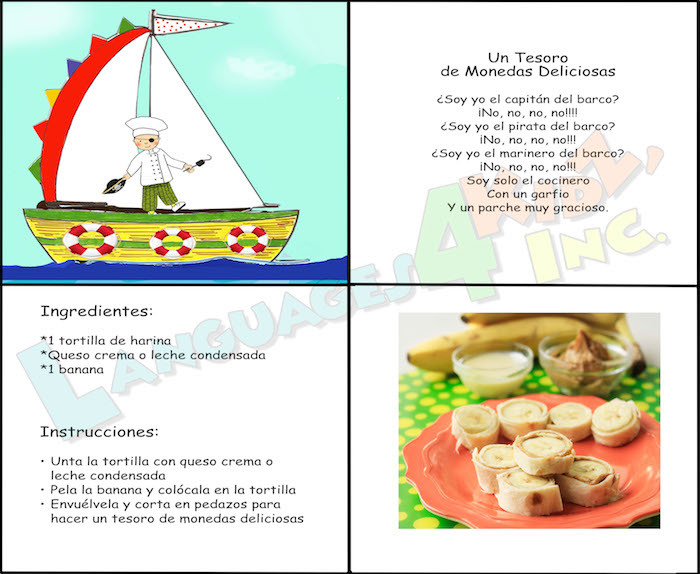 The poems and recipes in Spanish have illustrations and photos, making the book a wonderful language learning resource. 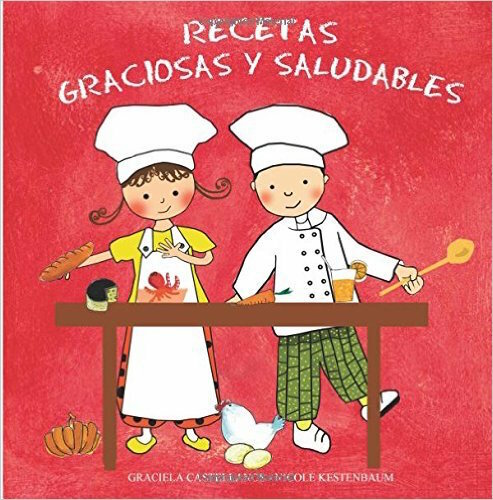 Recetas graciosas y saludables is published by Languages4Kidz.com. In the photo below, you can see the four related components: poem, illustration, recipe and photo. There are two kinds of readings in this book, poems and recipes. The two are related in that the recipe is for a snack that represents a key element of the poem. The two types of readings use different types of vocabulary, are at different levels of difficulty and let children practice different skills. The poems are at a range of difficulty with themes that are familiar to kids, such as ants, pirates, and the moon and stars. All of the poems have illustrations to support language learners. For beginning learners, talking about the illustration provides an excellent alternative to reading the more difficult poems. Recetas graciosas y saludables has kid-friendly, nutritious snacks. The simple, no-cook recipes in Spanish are perfect for beginning readers and cooks. Talking about the photo first will help kids with both reading and cooking. It also makes a great follow-up as kids compare their results to the picture. Eating the snack is the ideal opportunity to re-read the poem and talk about the illustration again. This is wonderful hands-on language learning. Kids will love it! – are at a range of difficulty. – have illustrations that support the language. – use basic ingredients and vocabulary. – are a fun, hands-on activity. – have photos to support the ingredients and instructions. Languages4Kidz publishes curricula for both elementary Spanish and English learners. They also publish many content-rich Spanish picture books written by Graciela Castellanos. The Languages4Kidz Spanish picture books correspond to thematic units included in most elementary curricula. You can learn more about the Languages4Kidz picture books in this post. Visit the Languages4Kidz website to learn about all of their elementary Spanish learning materials. You can follow Languages4Kidz on Facebook. Disclosure: The company sent me a copy of this product to be able to write the article. I may have been compensated for my time. All of the ideas and opinions are my own.